Test-Prop 100 perfectly stimulates a set of muscle mass, burns fat, creates high-quality muscle relief, significantly increases the increase in strength. The drug also in some cases has a good effect on reducing the risk of the onset of such a disease as ischemia of the heart, coronary heart disease. When taking a steroid may increase libido. The drug begins to act very quickly, in just a few hours. Average Duration & nbsp; from 24 to 48 hours. The dosage of the drug initially begins with 50 mg, after which the daily rate of steroid on average is: 100 mg. Men take about once every two days, and women once every 6 days (dosage 50mg per day). The course lasts from 6 to 8 weeks. The average dosage of testosterone propionate Test-Prop 100 for an athlete is 100 mg every other day. 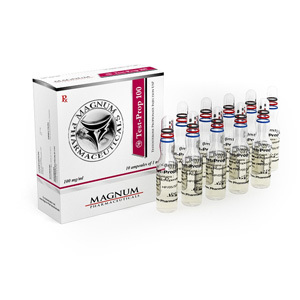 This is not a long-acting injectable steroid, therefore, to maintain effective concentration, regular administration is necessary (after 1-2 days). The Test-prop-100 course, as a testosterone preparation, can take place in a solo with an excellent effect, however, in order to develop optimal results, combined courses are usually carried out: with drostanolone, stanozolol, nandrolone, trenbolone, methandienone, boldenone, shouting with turinabol and others anabolic-androgenic steroids, depending on the tolerability, experience and tasks of the athlete. The duration of application can be 6-8 whole weeks (on average), which is enough for most athletes to develop results. How to apply Test-prop 100 combined with other steroids, interests both beginners and experienced athletes. Reviews of the drug is laudatory, marking superiority over many analogues. Demand is correspondingly. Therefore, further examples of combinational courses will be presented: with turinabol – to beginner athletes for high-quality muscle growth / drying; with drostanolone propionate – for drying by more experienced athletes; with Drostanolone Propionate and Trenbolone Acetate – the most experienced athletes for gaining lean muscle mass without excess fat, water and recoil.